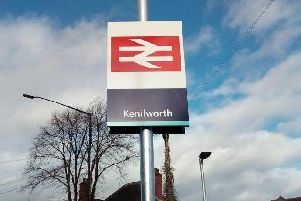 Ten people have been evacuated from a train which caught on fire at Kenilworth railway station today (Friday December 30). Warwickshire Fire and Rescue Service received a call just after 1.10pm to the fire, which was contained in the engine of the three-carriage train. Crews have estimated they will be at the scene until around 3.30pm. The train was a new type called the D-Train, built by Warwickshire company Vivarail. It was on a test run. National Rail has said delays between Coventry and Leamington will last until the end of service tonight. A spokesman for Vivarail said: “Whilst undertaking a test run today a fire started in one of the detachable engine modules on one of the power cars. “There were no passengers on the train and Vivarail staff were able to get off the train without a problem. “This has now been extinguished by the Fire Service and the train is being prepared to move back to Tyseley. “Until it is possible to access the engine module the cause of the fire can not be determined. “A thorough investigation will take place in conjunction with the Railway Accident Investigation Bureau and whatever steps necessary will be undertaken. “Vivarail regrets this means the planned trial on the Coventry to Nuneaton line will be postponed.